Ajam Media Collective is pleased to present a four-part series of recipes to help you celebrate Nowruz on March 20th. Nowruz, which marks the beginning of Spring, is celebrated as the start of the New Year across Iran, Afghanistan, Kurdistan, Central Asia and the Balkans. These recipes, compiled by Roya Soleymani, focus on Iranian culinary traditions associated with the holiday. These recipes focus on Iranian culinary traditions associated with the holiday. Click here for Roya’s recipes for ash-e reshteh and sabzi polo ba mahi. Roya grew up an Iranian-American in Seattle and visits family in Iran annually. Some of her best memories in Iran have been cooking with her grandmother, taking notes and keeping the delicious family recipes alive for a cookbook she is in the process of creating. Follow Roya on Instagram @rmsoleymani. Nun nokhodchi, or “chickpea bread,” are delicate cookies freshly made in bakeries all over Iran. Similar to shortbread but made with chickpea flour instead, these cookies will melt in your mouth and are best enjoyed with a cup of black tea. Nokhodchi are most common during Nowruz, when many Iranians include them on their haft sin for a sweet new year. When visiting family and friends for the holiday, one may stop at a local bakery and buy a box of fresh shirini, baked goods, for the host family as a gift. 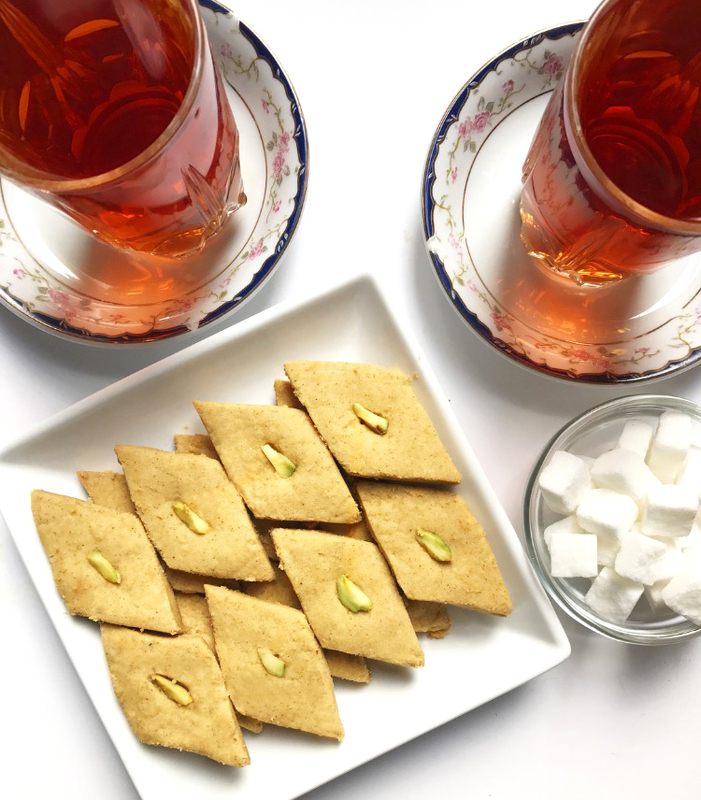 For most Iranians, one bite of these little cookies brings back memories from many Nowruz celebrations with loved ones year after year. Sift the chickpea flour, powdered sugar, cardamom and ginger* into a large bowl. In a separate pan, melt the butter and add the vanilla extract*. Pour the melted butter into the bowl of dry ingredients. Knead the ingredients together until it forms into a dough-like consistency. Let the dough sit for two hours. If the dough still feels too dry, slowly add in more melted butter one tablespoon at a time. You should not need more than two tablespoons at most. Roll out the dough ¼ inch thick. Cut out prefered shape and carefully place on baking sheet. A clover shape is most common but any small shape will do if you are not able to locate a clover cookie cutter. 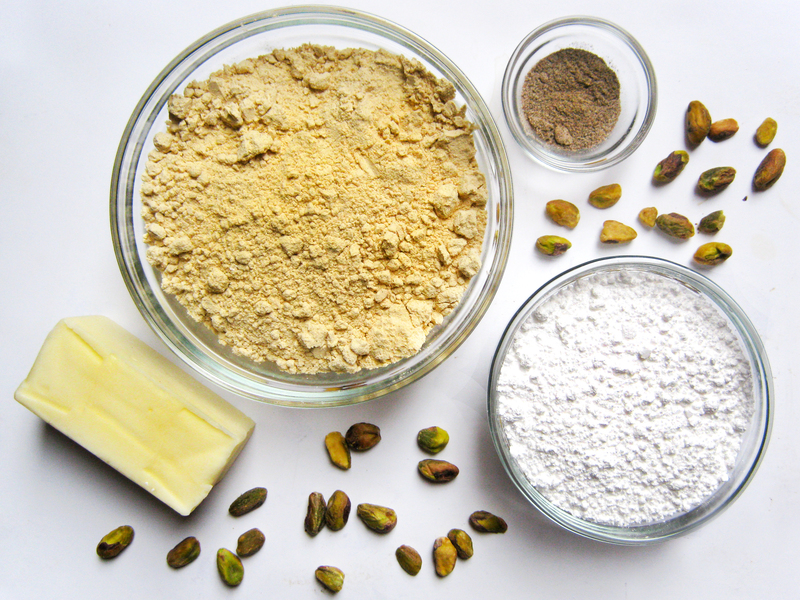 Press a slivered pistachio into the center of each cookie. Serve the cookies with Iranian black tea.